﻿ Penpals & Penfriends from around the World! Have you already registered? If not, register now by entering your log-in data. You don’t have a free account yet? ... then you are at the right site. At PenPalPalace.com we offer you a platform, completely free of charge, where you can find new snail mail penpals and communicate online with them. Learn languages with the help of native speakers from around the world. We help you to learn the english language completely free of charge. 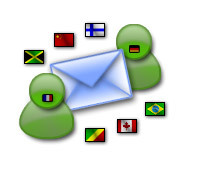 Find a pen pal for your language training or a pen friend who teaches you the desired foreign language. You can easily learn english, spanish, german, french, italian and even more complex languages like chinese, russian or japanese online from home.